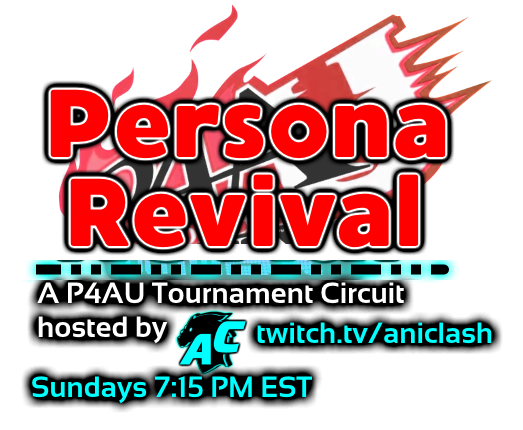 AniClash is hosting a P4AU Revival Tournament Series! This series will take place over a period of weeks, with the finale boasting a cash prize pool, along with other special events. Participants will earn seeding points based on their performance in the preliminary tournaments to be put into place during the finale. Please note that this series is PS3 only, and keep in mind the stage selection below. We are hosting a special event for the finale of our Persona Revival circuit. In this event, character teams will go head to head against each other. For example, a team of players using only Yu will go against players using Adachi. Be sure to vote in our strawpoll on which teams you'd like to see the most here. The finale of Persona Revival (coined Persona Prime) will take place in middle of December, and will boast a cash prize. Accepted Stage Selections: "School at Night with out Slime" Music Room or Alter Stage only. If you select the wrong stage, you will be given a warning once, than an automatic loss of one game.